To build “Twittens,” Canucklehead chose Sandvox. He chose the “Business” design for the site. People may want to visit the site if they are looking for texting gloves. In short, twittens are gloves for the text generation. There is a gallery of the products, and an about section to describe some of the 100's of uses twittens have. You can also contact us and of course, we wouldn't be much of a business without a place to buy twittens. Twittens were designed with tech-savvy people who live with colder climates in mind. Quite simply, anyone who wants to text message, use an iPod, or a variety of other things while keeping their hands warm will find twittens useful They are the text best thing! In short, twittens. They are simply the best product available at the best price. I'm a solitary man, not a faceless corporation and I believe the website reflects that. It is a little strange at times, but I like to have fun and this gives customers an inside look at twittens, and the man behind them. The website, like the business is brand new - so the wild anecdotes of my success will have to wait a little while. There is little question that it has gotten quite a bit of traffic and attention, especially considering that as of this moment I'm still not actually offering anything for sale. That will be rectified very shortly though. This is a design that I actually purchased for another project months ago that never came to fruition. It was a clean and simple design, yet very friendly and open feeling with great use of colour. While twittens is clearly a business, it is not my primary means of income and allows me the freedom to have fun with it and I hope this design shows that. 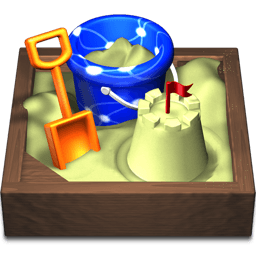 This is by no means a 'hard sell' organization, and this Sandvox design fits the image I'm trying to portray perfectly. At this point the site has had little done in the way of customization. In fact, attempts to build a custom header have been unsuccessful - but it's a work in progress. That being said, integrating an online store into the site is being done as we speak and at first glance appears that it will require more then a little customization - which will be interesting to say the least. This website was created by Canucklehead of Ontario, Canada. He has also built the eh list using Sandvox.